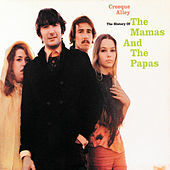 Creeque Alley: The History Of The Mamas And The Papas is an ambitious anthology that's a testament to creative curation. In addition to all the major hits (the title track, "Monday, Monday," the utterly timeless "California Dreamin'"), it contains a slew of deep cuts from the act's first two albums (both of which are foundations of '60s folk-rock). It also boasts selections from related projects The Big Three and The Mugwumps. On top of all this, interview excerpts have been scattered throughout; these help transform the sprawling tracklist into an audio biography, one that's deeply immersive.